Kim yeonwoo mentioned on radio today that he’s been coaching onew with his singing recently. Kim yeonwoo told Onew that he has not been to japan before, so Onew said “lets go japan together”. Kim yeonwoo ask Onew won’t he be recognized if they go out together. And jinki replied that without makeup nobody will recognize him. 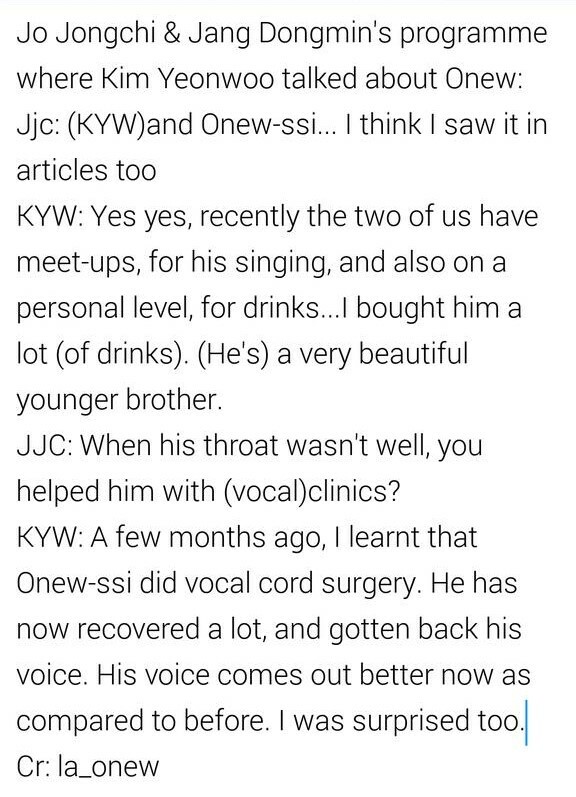 Kim Yeon Woo shared that he meets up with Onew a lot to drink. Sunny: I’ve heard that Onew is receiving help from you. With the recent interview, I’m a bit shocked that KYW openly talked about onew smoking, but I feel relieved that KYW is trying to help him to quit. If I can meet KYW face to face, I really want to thank him for taking care of Onew and giving lessons to him, and also always showing his affection towards Onew. Credits to all of the subbers. Credit to onlyoujinki for reupload.